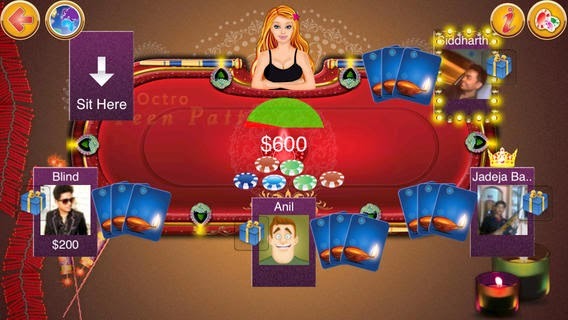 Teen Patti by Octro is multiplayer card game that you can play with bots (computer) and with your Facebook friends anywhere in the world. You can play in public room or in a private room where you can invite your friends and decide the bet per point. In the Teen Patti game you win or lose chips. The chips have no real cash value. The game does not involve real gambling. It is completely free. It is a social game. If you lose all your free chips, you can buy more chips to play for longer period. 4. Live in-game chat and exchange gifts. Come Enjoy - Bollywood Style !